The Young Vic is known for having their finger on the pulse, and their decision to revive Jesus Hopped the A Train is no anomaly. The themes of a failing justice system, a lack of social care and questioning of morality make this 2001 play feel as if it could have been written yesterday. 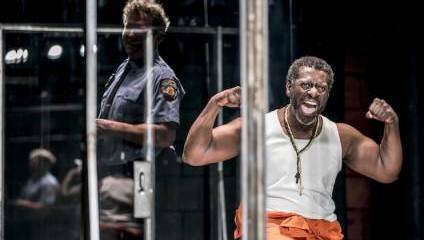 Two men, the thematically-named Angel and Lucius (Ukweli Roach and Oberon K. A. Adjepong respectively), are both in prison on New York’s Rikers Island with charges of murder levelled against them but in wildly different contexts, meet in the yard in solitary confinement. Interspersed with meetings between Angel and his lawyer (Dervla Kirwan), interactions with cruel guard Valdez (Joplin Sibtain) and monologues on the characters’ futures, we watch as the two men debate their own morality and each other’s. Every character here is morally ambiguous. Even Valdez, who seems in danger of becoming a caricature, gets his nuance. Kate Hewitt directs this version of Stephen Adly Guirgis’ play cleanly into 2019. The writing fizzes and pops like firecrackers: everyone in the play is wickedly funny, and watching the two prisoners debate religion is like watching a game of tennis where the ball is on fire. Of course, this wouldn’t work unless the actors were also superbly charismatic with excellent timing, which they are. Roach's Angel is powerfully sympathetic and moves between macho bravado and intense vulnerability with grace. Of particular charm is Adjepong as Lucius, delivering his lines with gravelly aplomb and managing perhaps the most nuanced depiction of a serial killer I have ever seen. Kirwan also deserves a mention for her excellent work as the morally conflicted Mary Jane. The production comes up to meet the fiery challenge set by the writing. The set (Magda Willi) is highly effective; glass doors move back and forth along a traverse stage, creating bigger or smaller spaces between them to represent a cell or prison yard. The sound, crashing and swelling, at times reminiscent of meditative gongs, and the lighting, bright and blinding, intensify an already intense experience. Though it is true that the play raises more questions than it answers: what should we do with our guilt? Does taking responsibility mean accepting punishment? Are we responsible for our own actions or do we have a duty to the collective good? But it’s in the way that the play shows us the difficulty – sometimes impossibility – of answering those questions is what makes it so good in the first place. At its heart, it is an absolutely compelling story about two men who society has condemned and the inner and outer battles they face with the case of their humanity.